Matt Clarke on the enigmatic Blue Jack Dempsey, now called Rocio octofasciata. 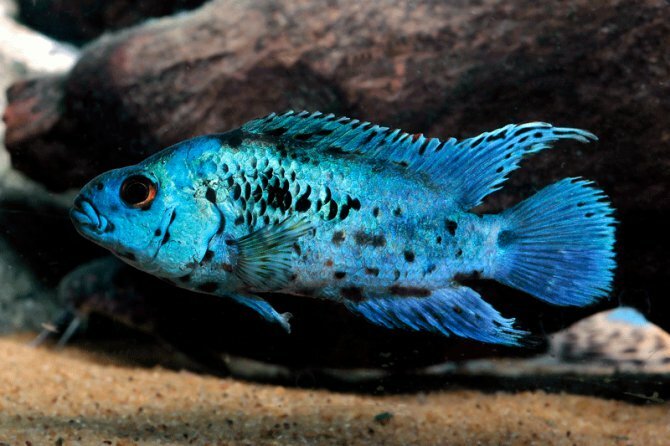 Common name: Blue dempsey, Blue Jack Dempsey, BJD, Electric blue Jack Dempsey, EBJD. Scientific name: Believed to be a form or hybrid of Rocio octofasciata (Regan, 1903), formerly "Cichlasoma" cf. octofasciatum. The species was renamed in a revision by Schmitter-Soto in 2007. (See Convict and Jack Dempsey placed in new genera, News, 1 October, 2007). Origin: The wild-type "C". octofasciatum is found in North and Central America, from Mexico to Honduras and Guatemala. There are no confirmed reports of this variety ever having been collected in the wild " it's highly likely to be man-made. Size: Jack Dempseys reach a size of up to 25 cm/10", although 20 cm/8" is a good size for a male, with females normally at 15 cm/6". Water: Adaptable. Moderately hard and alkaline, say pH 7.0-8.0, GH 10-20, with a temperature around 25-28C/77-82F should be fine. Diet: Not fussy. A staple diet of pellets can be supplemented with frozen foods and the occasional earthworm. Aquarium: This is a relatively heavy-set and aggressive species, which is why it's named after the heavyweight boxer, Jack Dempsey. A pair really deserves a tank of at least 90 x 35 x 45 cm/36" x 15" x 18". Picking a sexed pair is going to be tricky, so you'll need to get six youngsters and allow them to pair naturally, then rehome the remainder. Provide plenty of rocks, ceramic flowerpots or bogwood to provide shelter. Some people claim this variety is less aggressive than the wild type octofasciatus. Can be kept with other Central American cichlids in larger tanks. Notes: There has been heated debate over the origin of this fish. Some believe it is a hybrid, some believe it was discovered in the wild, and others believe it was selectively bred by breeders. The retailer selling these says these specimens were tank-bred in Argentina, and its supplier claims the fish are of hybrid origin, but not from a straight cross with another species. Other suppliers of the fish disagree and claim that the fish is selectively bred. They're not a fish for purists, but they are one of the best-looking cichlids currently on sale. Availability: These have been sporadically available in the UK for several years. We photographed these at Pier Aquatics in Wigan.